ZQuiet Review - A Cool Anti-Snoring Mouthpiece | Fix Your Sleep Today! If you’ve read my post on oral appliances, you’ll already be familiar with mandibular advancement devices (MADs). Our ZQuiet review pertains to one such anti-snoring mouthpiece, and it is our hope that this will help you to make the decision as to whether or not this product is for you. ?As you may know, MADs?are intended to move the lower jaw forward by a few millimeters. The intent is to open the airway in order to reduce snoring and improve your sleep quality. How Exactly Does the ZQuiet Work? As a jaw retaining mouthpiece, the ZQuiet’s function is executed based on how well it fits in the mouth and the firmness with which it is able to hold the lower jaw in place. It is especially effective for those who have narrow jaws that may compromise their breathing at night. A good way to check for a narrow jaw is to look at the sides of your tongue. If you see incidences of ‘scalloping’, or impressions of your teeth against the sides of your tongue, then there’s a good chance that your jaw is a bit small. This makes it more likely for your tongue to be pushed back into the airway while you sleep, since when it loses muscle tone, there’s nowhere else for it to go! Using a mandibular advancement splint like the ZQuiet however can help to mitigate this problem by repositioning the jaw forward, this giving the tongue more ‘room to play’. ZQuiet prides itself on its Living Hinge technology which it claims to be a revolutionary design which increases the comfort and effectiveness of the device. ?The device “moves with you” so to speak since it is able to accommodate some amount of natural mouth movement over the course of the night, while still maintaining the position of the jaw. Some MADs tend to be very stiff and rigid which is a huge turn-off to some users, especially since we all don’t have similar jaw structures. The ZQuiet has largely eliminated this weakness by simply not locking the device in place! While the above sounds great however, designing the product in this way introduced a necessary trade-off. Many MADs out there are of the “boil-and-bite” variety, ie. they must be first be boiled and then fitted/molded to the wearer. These are made out of thermoplastics and can be fairly bulky, which makes for an uncomfortable experience in many cases. Since the ZQuiet departs from the makeup of traditional MADs on the market, it doesn’t require any kind of custom molding or fitting. The product designers focused instead on creating?a thinner, more compact device with an improved hinge. Obviously this makes it more comfortable, but at the expense of adaptability. While a boil-and-bite splint can be remolded a few times before completely degrading, the ZQuiet is more of a ‘one-size-fits-all’. As a result, one could say that your mileage may vary depending on whether or not your jawline falls within the parameters of what the product was designed for. As far as fitness for purpose goes, this is my only gripe about this devices since the ability to adjust the fit can be a dealbreaker (since how the device distributes pressure against the teeth can’t technically be altered). In terms of usability, most users can pretty much utilise the ZQuiet right out of the box (after running it under some warm water of course). It’s made of a medical-grade thermoplastic compound that contains neither BPA nor latex (and is thus unlikely to cause irritation). It has also been cleared by the US Food and Drug Administration and is classified as a class II medical device. If you’ve popped it in and the fit doesn’t feel right, the company provides instructions on how to trim the appliance with a pair of scissors as well as file away any rough edges. To give you some flexibility of choice as well, Sleeping Well LLC (the makers of ZQuiet) no longer send one, but TWO ZQuiet appliances in each purchase, with different jaw alignment settings! It’s pretty neat that the device has airflow posts as well to allow you to breathe through your mouth as well. While I don’t really recommend mouth-breathing, I do recognise that some folks out there do have nasal passageway problems and that this intervention may just be that low-cost solution that can help them improve their sleep without great expense. Who Can Use the ZQuiet Appliance? As with most oral appliances, using the ZQuiet will take some getting used to. Many users reported drooling and jaw pain within the first few days of use, but in most cases these cleared right up. Some slight teeth/gum pain was also reported early on. These discomforts normally go away for the majority of users however, which has allowed ZQuiet to boast a satisfaction rate of approximately 94%. ?You can also see for yourself what ZQuiet users have had to say about the product by checking out the Reviews Section of their website. I should mention an important caveat at this time however–please do not use this product if you use dentures. Do recall that all jaw retaining devices exert pressure on the teeth in the lower mandible–it’s how they hold the jaw in the forward position. The same applies?if you have an excessive overbite/underbite. In the case of an excessive overbite, the forward extension of the ZQuiet could cause TMJ (temporomandibular joint) pain. This is pretty noticeable right below your ears. If you have an excessive underbite on the other hand, it is possible that the device may not work as you expect since at best the lower mandible may only be brought into alignment with your upper jaw. In these instances, you may be better off trying the Good Morning Snore Solution?instead since it’s?a tongue-retaining device and doesn’t wholly depend on your teeth to work. Additionally, please observe that the product is not meant to manage symptoms or issues related to sleep apnea. For this you should consult with your sleep specialist and have a sleep study done (if you haven’t already) to decide on a means of intervention. If you’re already on CPAP, that’s awesome so please continue to stay the course! At present, you can try ZQuiet for 30 days for a minimal fee of US$9.95 (which pays for shipping and handling and is nonrefundable). If you decide to stick with the device after the trial period, somewhere around day 35 your card will then be charged an additional US$79.95. You have the option of standard or expedited shipment as well, with the former taking 8-12 business days, and the latter taking 3-5 (for an extra 8 bucks). In my personal opinion, stick with standard since many users have received their devices in around 3-5 business days anyway. Do recall however that the 30 days mentioned in the trial begin at the point at which the order is shipped, not when you receive the device. Also, in order to qualify for an RMA, you should contact ZQuiet customer service for return instructions and an RMA number before the 30 days have expired. You will be responsible for all return shipping costs, and should do your best to ensure that the ZQuiet reaches Sleeping Well’s warehouse on or before day 45. Having said all that, let’s move the conversation towards summarising the Pros and Cons of the solution. 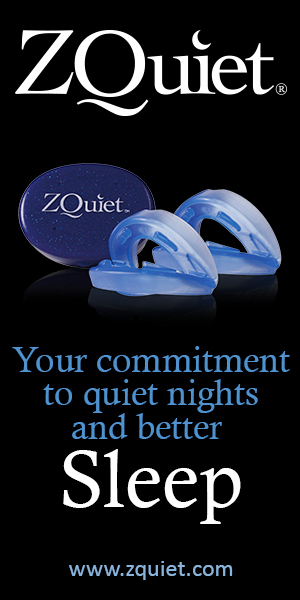 So to cut a long story short, would I recommend the ZQuiet Solution to anyone who wishes to kick that snoring habit. The answer is a resounding YES. I do believe it’s clear that the device is definitely well-suited to its overall objective: ie. helping the wearer get some quality sleep. If this meets your criteria, go ahead and buy via the link below. Note that the link below may generate revenue for the site when a purchase is made which helps keep us up and running! Click Here to Get Your ZQuiet Today! Have you used this product before? What was your experience like? I would love to hear your insight and experience, so don’t hesitate to drop a comment below. You just became my favorite blog site! I have seasonal allergies 12 months a year lol, so sometimes my breathing is troubled while asleep. It’s great to see though that this appliance has room to mouthbreathe, since when I’m all congested that’s the only other option. Thanks so much, this was pretty informative! Hey Laurie, it heartens me to see that you enjoyed reading! I thought the airway was a neat addition too, since, like yourself, I’m also troubled by allergies all year-round. Sinus inflammation is the bane of my existence, sadly enough. I don’t know if I could sleep with something in my mouth! Wow, I didn’t know that there were products like this that helped with snoring. You taught me something new and your review was very thorough. Thanks Marlena. You’d be surprised how easy it is to get used to sleeping with a mouthpiece after a little while. Once the benefits kick in, you’re definitely not likely to stop either! Hey Vic, the recent uptick in devices is fairly recent, make no mistake! The problem is most of us don’t care much about sleep initially so we tend to sacrifice it way more easily than we should. The ZQuiet indeed comes with two devices, and a very nifty trial period. I agree with you, service like this is unusual! Wow, it was really interesting, I enjoyed reading. I actually was not aware that sleep disorders had a dental side, so this was eye-opening. Thank you for sharing this! No problem Daniel, it is my pleasure to educate! Many moons ago I got a Pure Quiet Z’s Sleep mouthpiece for a bf. Not the ZQuiet but it was a MAD. It worked just fine but it would have been a lot more effective if he didn’t refuse to wear it lol. He complained that it was uncomfortable and made his jaw ache all day. So I can definitely appreciate you highlighting all the caveats and suggestions for different products based on circumstance. Hey Michelle, I’m sorry your bf had a poor experience. You really have to look out for the jaw pain, and if you have sensitive teeth, it can be pretty irritating. The ZQuiet has a “living hinge” thankfully so that would improve comfort in the vast majority of users. And if that fails, a tongue retaining device is always a good bet as well!